Everyone is snacking like crazy today for the Super Bowl, and it’s so much fun to think of something new to try to add to the usual line-up of nachos, chili, and buffalo wings. 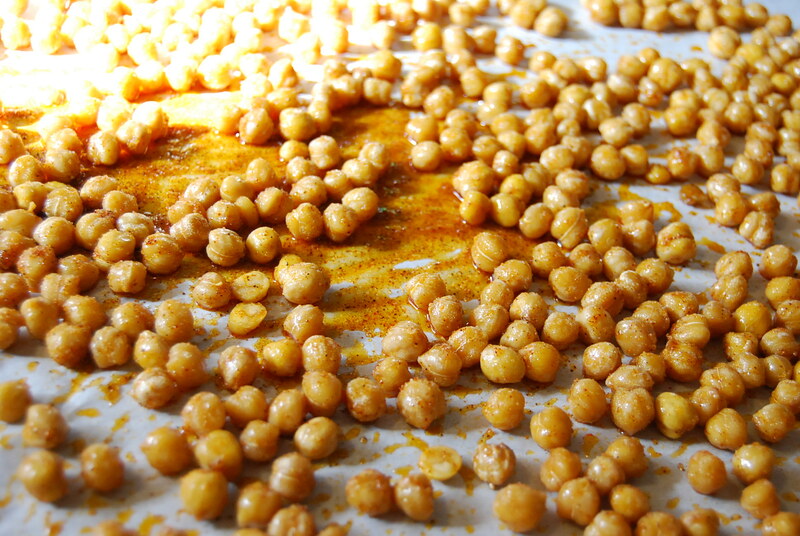 I found something that would be appreciated for healthier eaters, or for any vegetarians at your gathering: Spicy Baked Chickpeas (also called garbanzo beans, which is way more fun to say). I saw something similar to this recipe made by Claire Robinson on Five Ingredient Fix on Food Network, months ago. My oldest son kept asking me to make them, so today I broke them out to have for snacking today. Very simple, and versatile, as you can spice them in any way you’d like, and the longer you bake them, the more crisp they get, so you can find out your favorite way to make them for your family and friends. 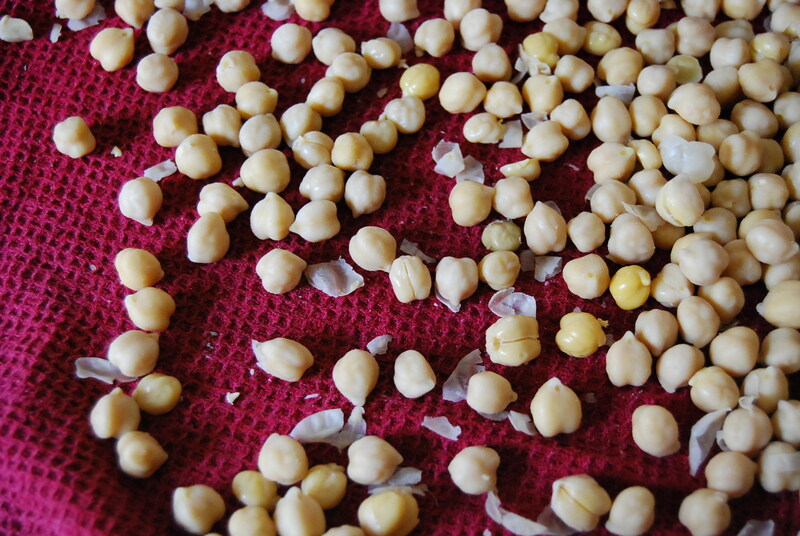 Place drained and rinsed garbanzos on a clean kitchen towel on counter. Lay another clean towel atop them, and carefully rub the beans to completely dry. As you do this, the thin skins will also come off the beans, which is a good thing. It helps them to better crisp in the oven. Next, line a baking sheet with parchment paper. 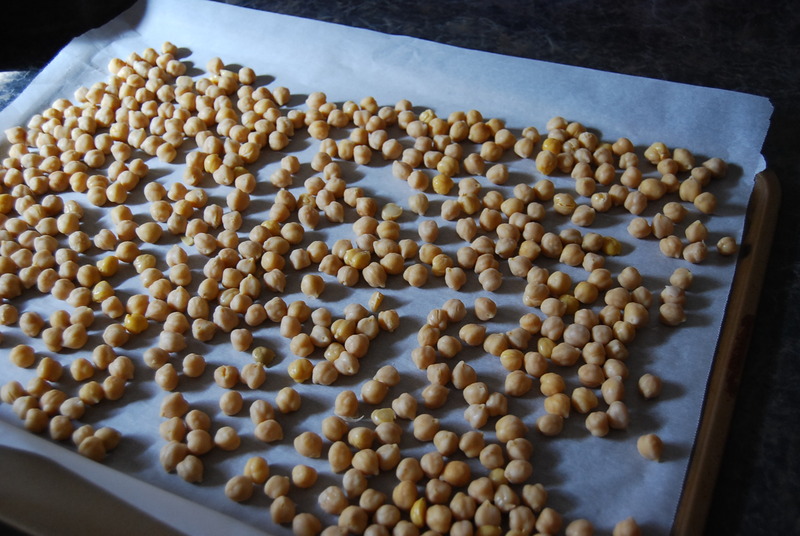 Spread dried beans on the sheet in a single layer, and bake at 400 degrees for ten minutes. While they’re baking, in a small bowl mix olive oil andhalf of spices together. Taste before adding all spices, as you may want to adjust. When ten minutes have passed, remove beans from oven, use the parchment to funnel them into a mixing bowl, and then pour over the well-mixed oil/spice blend. Stir it in well, until all beans are coated. Then return to cookie sheet, and bake for twenty minutes. Remove two or three, being careful not to burn yourself, to test for desired crispness. The original recipe recommends 25 minutes. What a fabulous idea for a healthy snack – yummy. 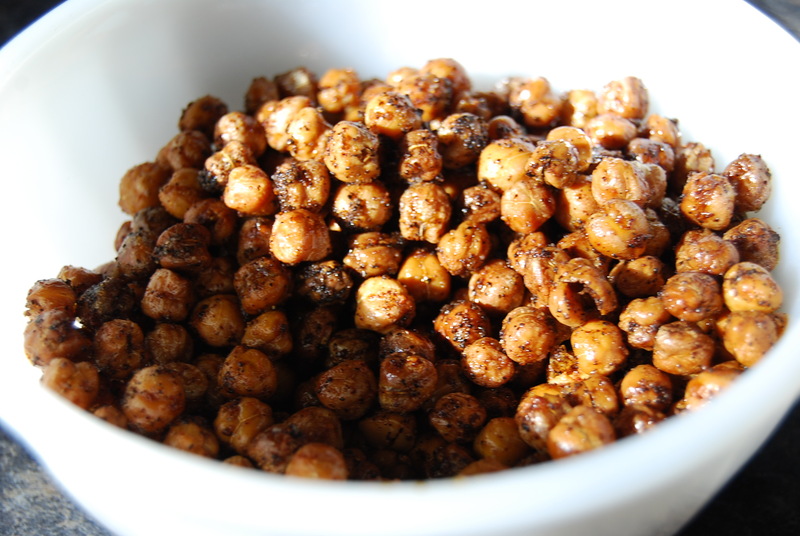 I recently fell in love with a pre-made snack mix that included roasted chickpeas. Will have to try these. Thanks! Sure, I’m glad to share. I hope you like them, too! That is amazing, simple but delicious. It’s a nice and healthy snack for me and my siblings.